The next 8 colors C-Lon Bead Cord are here. It is a thrill to see all the new colors in their little boxes after being part of the process of selecting them. I have to admit, I cheated and already used some of these new colors from the sample spools, such as Red-Hot, Charcoal and Olivine in several pieces. I look forward to creating new pieces with these colors, and hope you will also find some of these new colors great for your creative projects. 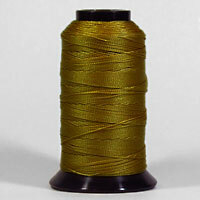 + Other New Additions: New vintage Tex 135 nylon cord, available in 10 'rainbow' colors. The size is in between C-Lon Bead Cord/Nylon #18 and C-Lon Micro Cord/Nylon #69. It is perfect for all the times when the standard size C-lon Bead Cord/Nylon #18/Tex 210 is too large and the Micro/Tex 70 size is too fine. By coincidence two of the colors match Red-Hot and Black Currant perfectly. 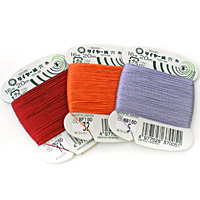 + New colors of Nylon #69 in both bobbin size and 1 oz spools. Great News - C-Lon is releasing 32 new colors of C-Lon Bead Cord. The first 8 colors are in. 8 additional colors mid-October, then 16 more in the first half of next year. This will bring the full color collection of C-Lon Bead Cord up to 104 colors. A new comprehensive color chart will be compiled when all the colors will be in. Notes on the new colors: Argentum is a great neutral gray, right in between White and Grey as to value, a bit on the cooler side when compared to the warmer Nickel or the even warmer Silver. Antique Gold, when compared with Bronze, Tan, Marigold & Gold, is right between Bronze and Tan. In value it is a bit lighter than Gold, but a bit darker than Marigold and Tan. French Lilac is a muted tone darker than Lavender, lighter than Medium Purple. Cerise is a dark rose tone. When compared to all the other pink and rose C-Lon shades, it is darker and more muted than Light Orchid and it does not have of any yellow cast. Cyan is a bright tone, a bit darker and bluer than Aqua. Cerulean is a bit bluer and more toned down than Teal. Periwinkle and Hyacinth are lighter shades of Persian Indigo. September 21, 2009 - D&E/Mastex Colors Back in Stock! Crown knotting or the crown knot sennit is an elegant solution for stringing beads with larger holes such as antique beads and keeping them from touching each other. The crown knots have many advantages over traditional overhand knots. The knots are completely symmetrical. They are easier to keep snug against the beads and are especially well suited when stringing beads with large holes or uneven holes as the ratio between the cord going through the beads and the actual size of the knot is much larger than with overhand knots. This class will teach how to tie 4-strand crown knots with the use of a kumihimo disk, a method that makes this process much easier to learn and master. The class project will integrate the clasp with a button and loop seamlessly with no loose thread or thread ends remaining. June 29, 2008 - New Addition - Fujix Tire Silk #16 Buttonhole Twist Weight - I just received the full collection of this silk (new to me) on Friday. I worked as quickly as I could to add it to the store, sorting colors and creating the jpegs with eye breaks in between. The complete collection comes in 121 colors and compares to the Kanagawa 1000 Denier Embroidery Silk. I worked on a cavandoli knotted neckpiece with silk and nylon (C-Lon Sepia) over the weekend and could not differentiate between the two silk brands unless I looked at the name on the card. So if you enjoy working with the Kanagawa silk, you will love the additional color choices this new silk provides. 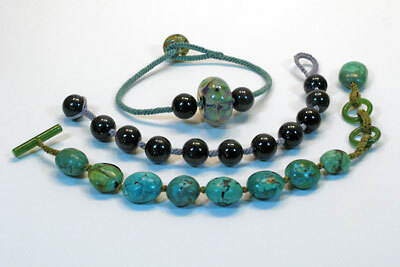 Tuff Bead Cord is getting very popular - especially Size 3. It is an ideal size for crochet ropes with seed beads size 8/0. This cord is also recommended in the new book on Micro Macrame by Annika de Groot. See my blog on Annika's book. I keep ordering Tuff bead Cord and selling out, and the company I order from seems to have the same problem. They keep being out of stock too so bear with us until we adjust to the increased demand! Also just in Slate Vintage Mastex Nylon #18. March 25, 2008 - I went to teach in the Boston area and while I was away my studio got repainted. The teaching went well even tough the subject was hard. Thank you to all who attended and to Bead Designer International for inviting me. I also got to briefly visit Boston, ride on bicycle along the Minute Man Trail between Lexington and Concord and attend CraftBoston. I worked hard to reorganize my studio upon my return and it's still ongoing especially as I keep getting more thread! I have been working with silk thread such as the Kanagawa 1000 Denier Silk, Silk Floss and Silk Cord combined with Nylon #18 or C-Lon Bead Cord. Most of my silk floss supply was purchased long ago in bulk and then hand dyed in small skeins in many shades. Slowly over time I have used up my supply and of course it is no longer available in bulk. 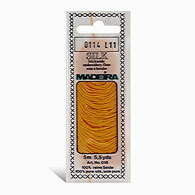 I find the Madeira 100% Silk Floss to be one of the best floss currently available. It comes in 108 colors, so a sufficient color range for most applications. Good news: It is a pleasure to announce that C-Lon has expanded their C-Lon Bead Cord colors offered to our niche industry especially at this time. The C-Lon Bead Cord is the original bead cord weight. The 8 new colors brings the color range to 72 colors. As an artist working with Nylon #18 for many years, the color range offered by C-Lon is beyond my wildest dream!